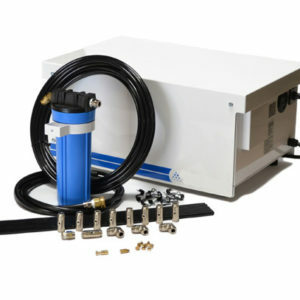 This kit includes all of the components needed to install a 200′ fog system. 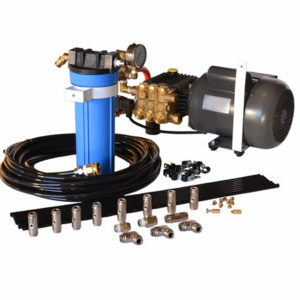 Included is our most economical direct drive pump, quick connect fittings, fog nozzles as well as all of the required tubing, fittings and inlet filtration. Many professionals and hobbiests choose a direct drive fog pump due to lower cost without sacrificing reliability. One main drawback of a direct drive pump when compared to a pulley driven pump is the sound level. Direct drive pumps are typically louder than pulley driven pumps. So if budget is more important than sound levels, a direct driven pump is probably the best option. 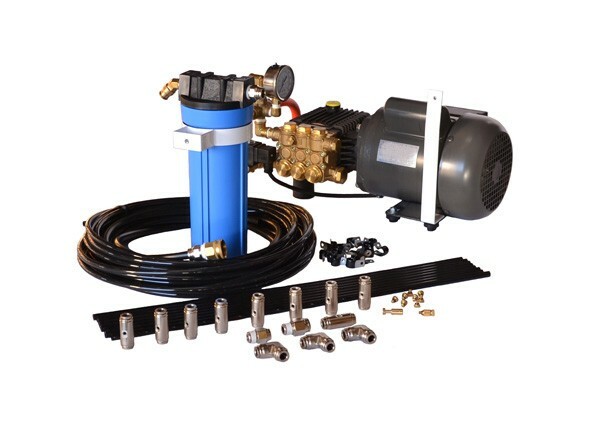 A direct drive pump system will provide years of uninterrupted and reliable service. Several models are available suitable for a small greenhouse or patio application to larger warehouse or commercial type projects. Larger pumps are available upon request.